A recent and famous image from deep space marks the first time we've seen a forming planetary system, according to a study by University of Toronto astrophysicists. The team, led by Daniel Tamayo from the Centre for Planetary Science at U of T Scarborough and the Canadian Institute for Theoretical Astrophysics, found that circular gaps in a disk of dust and gas swirling around the young star HL Tau are in fact made by forming planets. 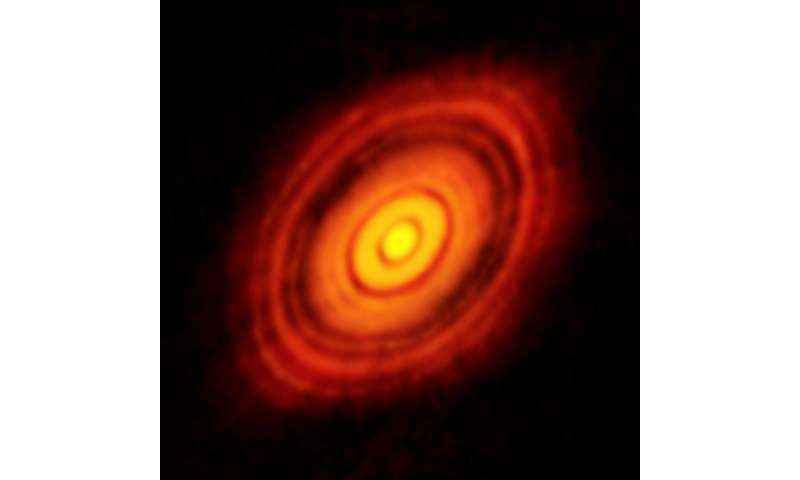 "HL Tau likely represents the first image taken of the initial locations of planets during their formation," says Tamayo. "This could be an enormous step forward in our ability to understand how planets form." The image of HL Tau, taken in October 2014 by the state-of-the-art Atacama Large Millimeter/submillimeter Array (ALMA) located in Chile's Atacama Desert, sparked a flurry of scientific debate. While those who observed the original image claimed that planets were most likely responsible for carving the gaps, some remained skeptical. It had been suggested that the gaps, especially the outer three, could not represent forming planets because they are so close together. It was argued that planets massive enough to carve such gaps should be scattered violently by the force of gravity and ejected from the system early on in its development. But Tamayo's study is the first to suggest the gaps are evidence of planetary formation because the gaps are separated by amounts consistent with what's called a special resonant configuration. In other words, these planets avoid violent collisions with each other by having specific orbital periods where they miss each other, similar to how Pluto has avoided Neptune for billions of years despite the two orbits crossing one another. Tamayo created two videos to show how HL Tau would appear in both resonant and non-resonant configurations. The system can be much more stable in a resonant configuration and it's a natural state for planets in the HL Tau system to migrate to says Tamayo. The HL Tau system is less than a million years old, about 17.9 billion kilometres in radius and resides 450 light years from Earth in the constellation Taurus. Since young systems like HL Tau are shrouded by a thick cloud of gas and dust, they can't be observed using visible light. ALMA resolves that issue by using a series—or an array—of telescopes located 15 kilometres apart that use much longer wavelengths. The result is unprecedented access to high resolution images that Tamayo says will continue to revolutionize the study of planetary formation. "We've discovered thousands of planets around other stars and a big surprise is that many of the orbits are much more elliptical than those found in our solar system" said Tamayo. This and future ALMA discoveries may be the key to connecting these discovered planets to their original birth locations. While the HL Tau system remains stable in its relatively young age, Tamayo says over billions of years it will act as a "ticking time bomb." Eventually the planets will scatter, ejecting some and leaving the remaining bodies on elliptical orbits like the ones found around older stars. Our solar system does not seem to have undergone such a dramatic scattering event, notes Tamayo. Future observations could also go a long way in determining whether our solar system is typical or an oddity ideally suited for life. "If further observations show these to be the typical starting conditions around other stars, it would reveal our solar system to be a remarkably special place," says Tamayo. The findings are available online and will be published in the upcoming edition of Astrophysical Journal. Let's edit that for accuracy. The outer rings may also be due to resonant scattering due to a significant inner planet. - If you abstract enough into your "philosophy" (ad hoc story of choice), testing theories by the data that constrains them will look 'circular'. But a basic understanding of hypothesis testing reject that story. Besides, this has worked for 400 years. - Creationists do not care for science, because facts show their magic ideas are false 'gods'. Also a 400 year old process. The paper is nice, but dense. Seems that if planets are less massive (neptunes), the system can end up with about half remaining. Kepler show this tendency in its bimodal distribution, statistically < 4 planets (typically 0-1) in old systems or >= 4 planets in young systems. Bravo! Kepler's hypothesis of solar system planetary resonances updated for new formation of exoplanets. Is it really true almost 30% of the US Americans still believe in creationism? Seeing the regular remarks in science articles (where I'd guess on a science website you'd be less prone to believe in 6000 year old earths), I'm starting to believe this might actually be true. We have a lot of Christians here too, but none of them believe in creationism. Considering there is a need to reconcile Bible stories with actual reality and creationism is a theory thought up by humans to match what the Bible says, I could probably think up of a better story to help reconcile the Bible with reality. Bring in some huge amounts of gravity in a dense newborn universe, add a pinch of time dialation, make it at an SMBH event horizon point of view and I'll have a story that perfectly describes a creation of the universe in 6000 years. I mean, that should make life a lot easier for creationist trying to read science articles, right? If formation of planets is made this way, can anyone tell me how is it possible that the center is made of hydrogen and the planets are made of other materials? In our solar system the first planet is 100% solid, shouldn't it be a gas planet made basically out of hydrogen? I think a possible explanation about this could be because of centrifugal force, like heavy elements are pushed towards the edge. But then how is earth nucleus made of iron and it has radioactive elements like Uranium (which is heavy element) in its surface? Wouldn't the heavy elements just spread out into space by this centrifugal force? Then why is not Neptune the heaviest planet? Except that Relativity theory isn't even clear about what happens to time near a black hole. It should be dilated twice: Once due to traveler velocity (special relativistic) and again due to proximity to gravity well (general relativistic). However, when the "experts" on science channel or in ANY text, including Hawking, discuss the topic they always forget to include the time dilation due to the orbiting rocket ship's velocity and only discuss the gravitational time dilation. Perhaps this is yet another thing wrong with professional galaxy models. The stars contain Tens and even hundreds of Earths worth of metals. Astronomers rarely talk about them except when "dating" a star. and usually when they say "metallicity" they are not actually referring to what a chemist would call a "metal". Uranium in the crust likely comes from new meteorites and some mixed in with other elements in magmas. It has a very long half-life compared even to the age of the Earth. Just because an element is atomically denser doesn't mean it always forms denser molecules. Radiation pressure. Small planets close to the sun experience a higher radiation pressure and their light elements (like hydrogen) are stripped away. To keep ahold of hydrogen an object close to a sun must be fairly heavy (e.g. 'Hot Jupiters'). Or they may have a strong magnetic field that shields from solar radiation. Or they may have a fairly dense atmosphere to start with which can lead to ionization of the upper atmosphere which in turn acts much like the protection afforded by a magnetic field. Note: The amount of material around an orbit closer to the sun (i.e. the amount that can be sucked up by a planet forming there) is less than a bit further out (assuming a disc of homogenous density - which is a not a quite correct assumption, but close enough to illustrate the point). Which would mean close-in planets are smaller to start with. You can predict where the third object will be and where the next N objects will be if you know where the first two objects are. It's that simple. Funny considering the BB is little more than a creationist story in it's own right. this image is a welcome feature that provides inputs to Spread functional Index. HL Tau, a Sun-like star located approximately 450 light-years from Earth in the constellation Taurus. Ren. Read this and then show, using the scientific method and leaving out god and the bible, us where the current theory is wrong.